So you think there’s no art to telling time? You think that whether it’s analog or digital, it’s purely utilitarian? Check out, then, the Schiphol Airport clock in the Netherlands, created in 2016 by artist Maarten Baas. 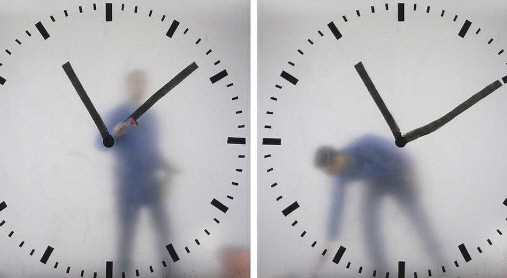 It features a silhouetted man (with just enough visible color—blue, black, and yellow—to pay homage to fellow Dutch artist Piet Mondrian)…on a never-ending task to erase and repaint the clock hands in accordance with the inexorable march of time. And you thought you were a slave to the timeclock. This entry was posted in New Post and tagged Art, Maarten Baas, Mondrian, Schiphol Airport Clock, What Time Is It?. Bookmark the permalink.